We created TRILLIUM®, our newest Shade Product, to address the need for a centrally supported shade structure that numerous clients have inquired about over the years. Its distinctive tree-like form is comprised of graceful "trunks" and "branches" that spring from a single, central foundation and reach out to support a broad fabric canopy. No water needed. No pruning. No leaves to clean up. 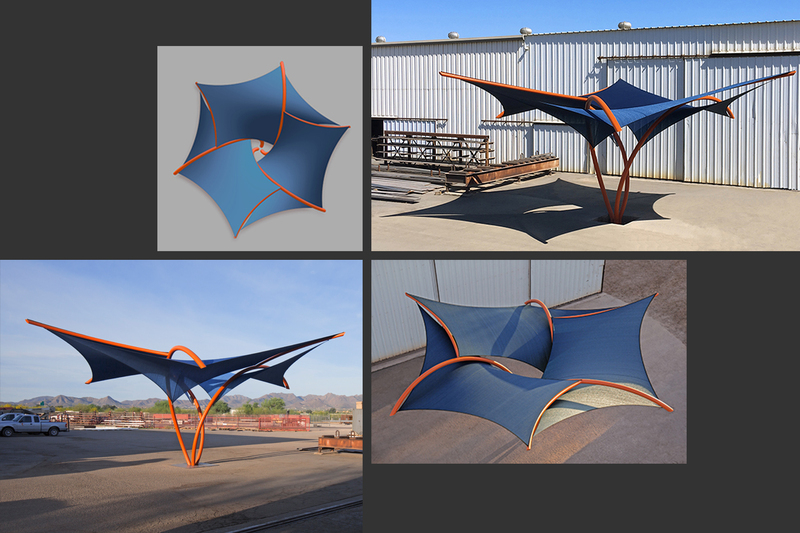 The structure is as functional as it is beautiful, providing an ample shade footprint and allowing for unobstructed movement and arrangement of seating around its circumference. The standard carbon steel frame can be sandblasted, powder coated, or painted to suit, and the long-lasting HDPE fabric canopy is available in an exciting range of 18 colors. Lighting packages and stainless steel frames are optional upgrades.